The Canadian Rockies are a mecca for those experienced in climbing and mountaineering, but for those who aren’t, instruction is available. Canmore, in the Bow Valley, is the self-proclaimed capital of mountain sports. Surrounded by towering peaks of limestone, routes to challenge all levels of ability can be found on the immediate outskirts of town and along narrow canyons that open to the valley. The distinctive south face of Yamnuska, easily recognized to the north of the TransCanada Highway as you enter the Bow Valley from the east, is the most popular climbing spot in the mountains, with dozens of routes up its sheer 350-meter-high (1,150-foot-high) walls. Bow Valley Rock (Rocky Mountain Books, www.rmbooks.com) is an indispensable book for Yamnuska-bound climbers. Experienced climbers should also gather as much information as possible before attempting any unfamiliar routes; quiz locals, hang out at climbing stores, and contact park information centers. For the inexperienced, the Canadian Rockies are the perfect place to learn to climb. Climbers and mountaineers can’t live on past accomplishments alone, so to finance their lifestyle, some turn to teaching others the skills of their sport. 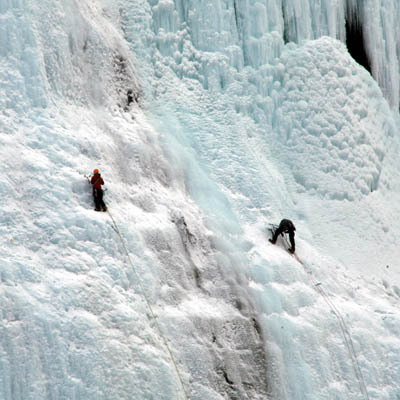 Canmore is home to many qualified mountain guides who operate both in and out of Banff National Park. One of these—and one of North America’s most respected climbing schools—is Yamnuska (403/678-4164, www.yamnuska.com). Learn basic climbing skills over an Outdoor Rock Intro weekend ($345 per person), with the option to make a full climb (an extra $245). The school also offers guided climbs of peaks throughout the Canadian Rockies, wilderness first-aid classes, and ice-climbing instruction.